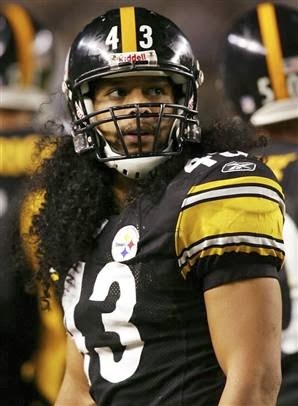 Highly regarded coming out of college due to his speed and hard-hitting style, Polamalu was chosen by the Steelers in the first round (16th overall) of the 2003 NFL draft. He had difficulty adjusting to the pro game as a rookie, but moved into the starting lineup at strong safety in ’04 and came on strong, intercepting five passes and gaining selection to the Pro Bowl. It was the first of five consecutive Pro Bowl seasons for Polamalu, and after receiving second-team All-NFL honors from the Associated Press in 2004, he was a consensus first-team All-NFL choice in 2005. Polamalu was utilized in a variety of ways, both in coverage as well as like an extra linebacker, in order to take advantage of his disruptive playmaking ability. However, his style of play began to take a physical toll. He missed five games in 2007, came back to intercept 7 passes as his coverage skills improved in ’08, but then appeared in only five contests in 2009 due to a knee injury. Steelers went 12-4 to finish first in the AFC North while leading the NFL in sacks (48), fewest rushing yards allowed (1004), and fewest points allowed (232). Won AFC Divisional playoff over Baltimore Ravens (31-24) and AFC Championship over New York Jets (24-19). Lost Super Bowl to Green Bay Packers (31-25). Polamalu followed up in 2011 by playing in every game and once more achieving consensus first-team All-NFL as well as Pro Bowl honors. However, durability again became an issue in 2012 as he missed nine games with a calf injury and there were questions regarding his future in Pittsburgh. He bounced back in 2013, playing in all 16 games and returning to the Pro Bowl. Overall through 2013, Polamalu has been a consensus first-team All-NFL selection four times, garnered second-team honors twice, and been chosen to the Pro Bowl after eight seasons. He has intercepted 32 passes, three of which were returned for TDs, and been credited with 12 sacks and 539 solo tackles.